Ganesh Pyne (b.1937-) is synonymously identified with the Bengal School. This judgment is in keeping with the fact that his works have the same detailing, an innate lyricism, a romantic feel, fine handling of forms and a subtle somber palette. Through his symbolic language he conveys an existential angst in reaction to the social conditions that he experienced. His figures, as in The Black Moon (1990), are posed somewhere between life and death, and there is always an enigmatic and eerie quality to his themes. Using his wash technique and tempera he created small but exquisitely detailed works. The intensity of these works is heightened with the dramatic play of light and shade. Keeping with the measures of modern art his forms are distorted and compositions flat. He is one of the pioneers of modern Indian art in an age where Indian artists looked towards the West for inspiration. Jottings and drawings are the innermost thoughts of an artist’s rumination. They illustrate the ideas that are forming in the inner landscape of the recesses of the creative mind .Sometimes these rumination find themselves evolving into larger artworks. Several nuances of creativity are spontaneous in a jotting that may not find a place in a refined artwork, and it is the rawness of spontaneity that is the quality of a jotting or drawing that is fascinating while looking at an art work. One talks about the “gaze” of an artist; it is this that is evident in a jotting. The Late Ganesh Pyne was a reclusive person for most part of his life. 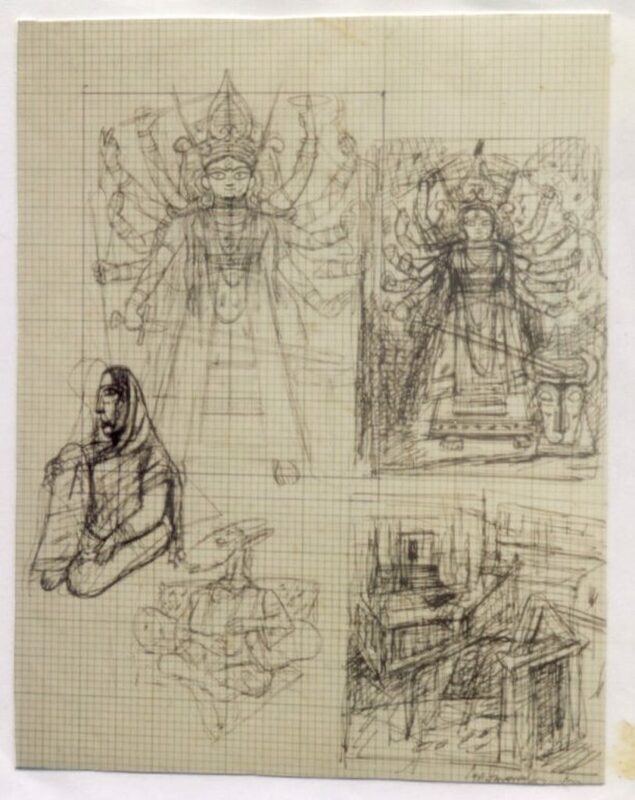 Having always lived in Calcutta, the ethos, mystery and haunting element in the history of the city shows itself in many layers of his paintings. His work is figurative and often the main artwork would revolve around a central character allowing the viewer to construct the narrative drawing from his palette and choice of imagery. It could be a human -beast like creature with may lines giving it energy or the confinement of a web. 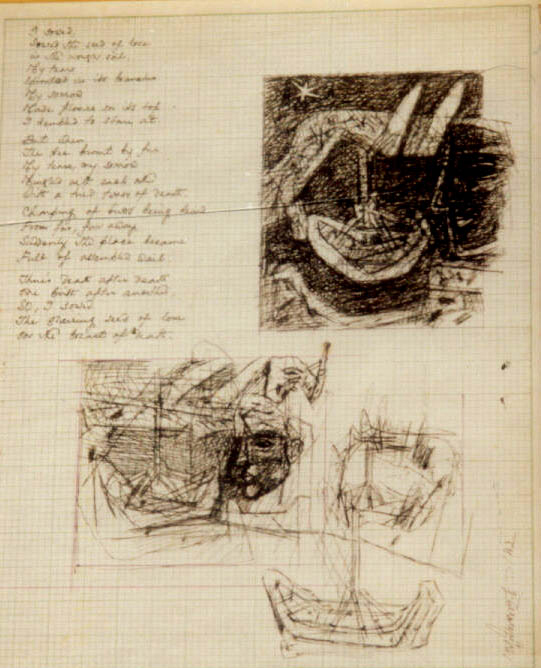 It’s is his treatment of the subject that connected subconsciously to the viewer with metaphors and moods. He left a lot to the view and hence the sense of mystery. Being a recluse he was not there in public to defend and demystify his tales yet giving enough to the viewer who wanted more. The led them in his transparency and yet clouded them and hence the idea of the translucent in reading his paintings. In many ways the jottings had more clues to deconstruct the mysteries he created in his finished painting that he laboured over for many months. The jottings allowed one to see some of the layers that were more open. 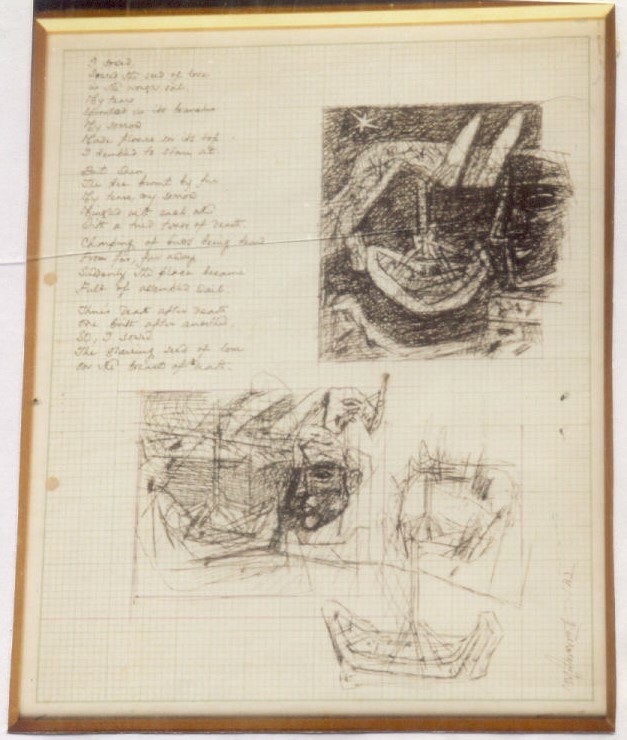 The walls of his studio were covered in drawings and jottings as he went back again and again to subjects the one finds recurring in his jottings, drawings and paintings in one form of the other. He was the epitome of a real artist lost in his own innermost thoughts that he went back and forth with over the years. This body of jottings from the late eighties was some of his most productive works came from give one clues to his ideas, thoughts and preoccupations. 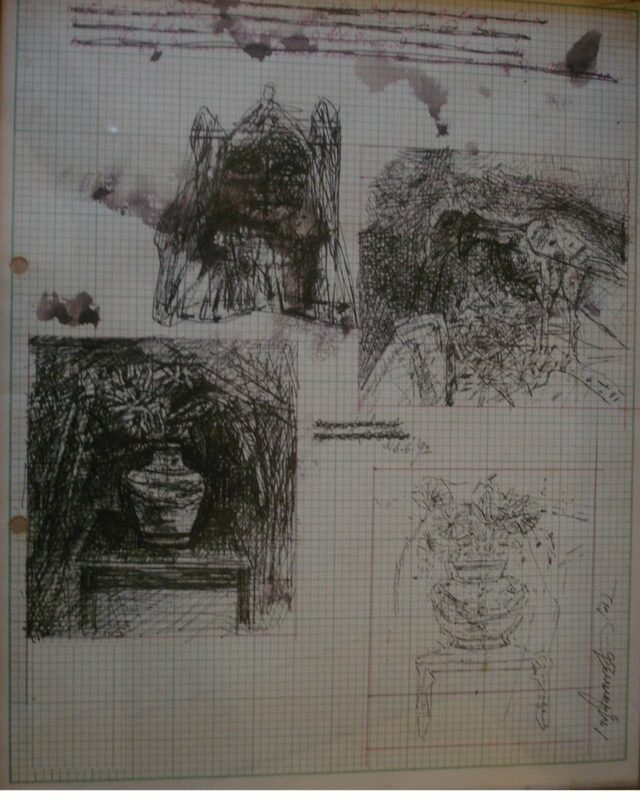 They are the translucent steps he charted towards his final artworks. Apparao Galleries – Chennai, No. 7, Wallace Gardens 3rd Street, Nungambakkam, Chennai 600006. From 20th January to 28th February 2019. 10am to 6pm.